Amidst the somewhat spooky surroundings of The Amersham Arms a welcoming crowd enjoyed a diverse double-bill of emerging and established talents this week, thank you to all who made it down! Next week we are very pleased to welcome back to our stage the Jensen Ehwald duo – those of you who saw them last year know to expect intimate and engaging music drawing from Northern Europe’s rich folk traditions. 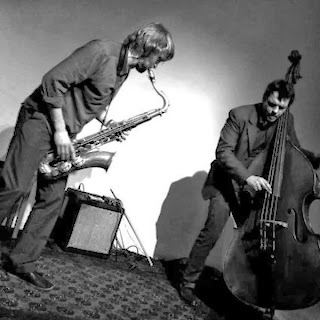 The Jensen Ehwald Duo consists of German saxophonist Peter Ehwald and Danish bassist Henrik Jensen. The tenor saxophpone complements the double bass perfectly in a minimalist approach to some beautiful German and Danish folk and traditional songs. The music is treated very loose and free, but with an underlying understanding of what is needed from each performer and piece. For the second set next Tuesday, Henrik and Peter will be joined by the SECollective’s very own Patrick Davey (Drums) and Alam Nathoo (Tenor Saxophone). As ever ticket’s are £5 on-the-door for what will undoubtedly be a cracking night, see you down at The Amersham from 8.30pm!